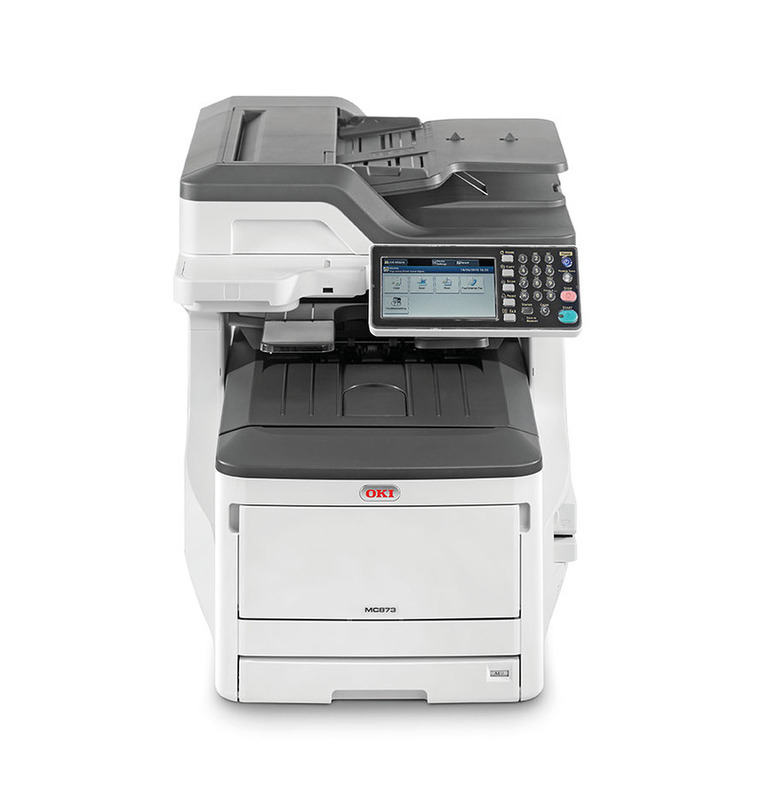 Low operating costs, a robust performance, and fast print speeds make the Oki MC873dn ideal for a busy workgroup. Despite its compact size, the MC873dn can handle tabloid-sized sheets and produce output in full colour. As a bonus, it comes with built-in fax, scan, networking, and copy functions, too, but it can be expensive to purchase and upgrade. Moreover, the output quality tends to be sub-par. This is a tall, heavy, and bulky multifunction printer that measures 700mm tall, 563mm wide, and 600mm deep, and weighs approximately 64Kg, so it may need a separate desk to hold it. The LCD touch panel is the most distinctive feature of the Oki MC873dn and it provides a modern touch to the otherwise industrial and plain design. Built for high volume use, the Oki MC873dn has a 400-sheet default capacity from a 100-sheet multi-purpose tray and 300-sheet main cassette. The ADF can handle 100 sheets. The RAM is 1.26GB and the processing speed of the MC873dn is 800MHz. There are two USB host ports, a high-speed USB 2.0 device, and Ethernet for connectivity. The Oki MC873dn scans directly to a network folder, flash drive, or to email. It supports directly printing from a USB key, too. It is easy to configure on-board due to the seven-inch colour touch screen panel. The powerful processor and memory make the Oki MC873dn capable of massive jobs. It faxes, scans, copies, and prints tabloid-sized output. The reversing ADF helps lessen paper usage, and the built-in hard drive makes it possible to store documents for later access. OKI provides a good warranty for the MC873dn. The Oki MC873dn is overpriced considering the limited paper capacity and below-average output quality. The bulky and heavy build takes up too much space and requires a sturdier installation surface. The print and scan resolution by default is only 600dpi, which may degrade the quality of highly detailed images and fine text.